In the instance where you have added new assets after the monthly depreciation journal has posted, and these assets should have been included in the monthly depreciation journal posting, you are still able to post this depreciation after the end of the calendar month. Click the cogwheel icon in the sidebar to navigate to the Administration page. Click into ‘Set up your accounting rules’. 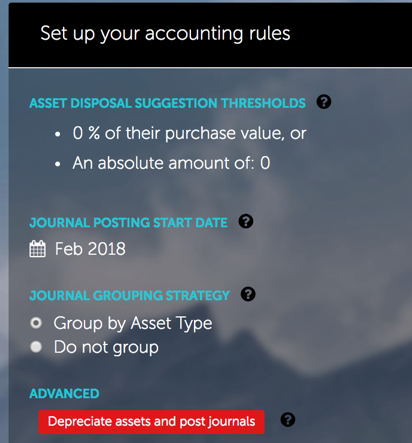 Click on the red button with the description ‘Depreciate assets and post journals’. This will force the depreciation to be posted for these assets. We suggest updating all of your assets not included in the monthly depreciation journal, and then selecting this button once to post depreciation. 4. Check the Journal Report to see the journal that was posted. Please note, we are only able to post depreciation for the previous calendar month.